﻿“Playwright Gail Louw’s masterpiece drama Blonde Poison has its American premiere at Beverly Hills Theatre 40. I was held captive for the entire ninety minutes. The story, based on the true story of Stella Goldschlag during the Holocaust, stars Salome Jens, who gives a brilliant performance under the superb direction of renowned director, Jules Aaron. Take such fine writing, exquisite acting with fine direction and you have a play that is not to be missed. This triumvirate created a masterpiece in this compelling drama”. “Under Jules Aaron’s direction, Jens manages to incarnate a monster while making her inescapably human: vain, terrorized, indomitable despite intolerable peril….Her (Jens) consummate skill in spinning a yarn sustains a transfixing campfire intimacy that mesmerizes with both horror and a sense of inescapable degradation. No salvation offered here, only the stubbornness born of ineradicable trauma”. “It’s a harrowing tale, told and acted with both passion and restraint. .. Louw is a skillful writer, and Jens acts the role with such profound conviction that we never question her reality. Her attempts at understanding and rationalizing her horrendous past actions seem both credible and moving. Her guilt may be profound, but so is her suffering. Director Jules Aaron frames the action with tact and sensitivity, and a finely invisible hand”. "I can’t tell you how much I admired everything about this performance. It was a privilege to see such an accomplished actress….. I was also impressed with Jeff G. Rack’s set. … But whether or not you are interested in this tragic true story, if you’re a fan of the theater at all, you have got to be impressed with Salome Jens’ performance. Besides that it’s wonderful, it’s amazing that anyone, let alone a woman of her age, could not only learn this difficult script, but perform it multiple times a month". “Under the amazing direction of Jules Aaron … Jens beautifully transforms what many would identity an evil character into a woman with whom audience members can sympathize. Playwright Gail Louw spent much of her life as an academic before concentrating solely on her truly exhaustively researched plays”. 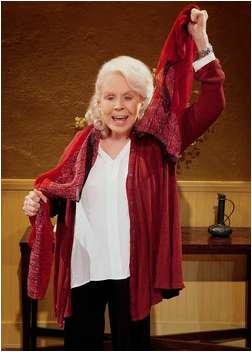 “Salome Jens Brings a Tour de Force Performance to the U.S. Premiere of BLONDE POISON at Theatre 40…The emotional depth of her performance will draw you into Stella's life”. “Salome Jens gives an absolutely riveting performance as Stella Goldschlag, the Berliner whose collaboration with the Gestapo sent thousands of her fellow German Jews to the death camps, in the American Premiere of Gail Louw’s Blonde Poison, now playing at Beverly Hills’ Theatre 40”. “It’s a harrowing tale, told and acted with both passion and restraint. The solo drama is essentially an artificial format: a single woman talking to herself at length about her past sorrow and malefactions. But Louw is a skillful writer, and Jens acts the role with such profound conviction that we never question her reality. Her attempts at understanding and rationalizing her horrendous past actions seem both credible and moving. Her guilt may be profound, but so is her suffering”.